MARS will allow scientists to perform real-time experiments almost a kilometer (more than half a mile) below the surface of Monterey Bay, Calif. The main computer and electricity source, or hub (orange vehicle), is connected to shore by power and fiber-optic cables. After years of planning and putting various equipment in place, researchers laid the first cable for the Monterey Accelerated Research System (MARS) observatory off California’s coast on April 1. At 891 meters (more than 2,900 feet) below the Pacific, the MARS observatory will be the first deep-sea, unmanned observatory in the continental United States that is connected to the mainland by cables that will provide data to scientists in real time. It is scheduled to be completed and begin operation later this year. The researchers are collecting data on everything from seismic activity, which helps determine when and how tsunamis occur to kinds of sediment and seafloor life, in order to record how the deep sea changes over time. Power cables will provide electricity to the scientific instruments and fiber-optic cables will communicate with the computers, video cameras and robots that make up the observatory. 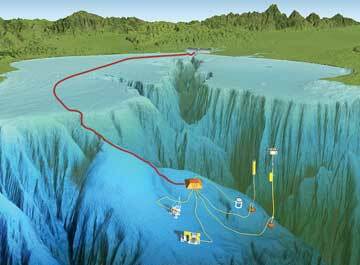 The cables will also allow this hub to send data back to shore 24 hours a day. If something goes wrong, scientists will know immediately, and they should be able to reprogram the systems without losing much data. Most current observatories rely on batteries for power and store their data on hard drives or disks, which then have to be retrieved in order for researchers to collect their information. Not only do batteries wear out, but the underwater retrieval of this information is costly. The research team, led by the Monterey Bay Aquarium Research Institute in Moss Landing, Calif., hopes that the MARS observatory will be able to remain on the seafloor for years and serve as a model for other ocean observatories.